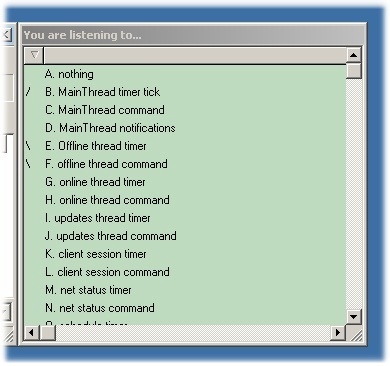 Audio-Visual thread debugging or "Place phone to the PC, please"
When debugging programs holding a number of threads, it can be real difficult to get an intuitive feeling of how these threads are progressing. One particular problem is knowing if all threads are still ticking along, since an exception in a thread can easily kill that one thread only. The human sense that is most tuned to detecting relative speeds and really small variations in relationships and tempo is hearing, so I got the idea to make the threads each play their tune, then simply lean back and listen to them. Not so amazingly, it turns out to be really useful. Freakish, but useful. The way I do it is to have a "secret" key combination call up a window with the list of commands to listen to (see screenshot). The user can now toggle each sound on and off by using the indicated alphabetic key. At the same time as a beep sounds, the little slash to the left wiggles back and forth, reinforcing the experience and at the same time making it easier to correlate the sound with the list of thread events. Also, some machines don't have sound, and then the wiggly slash is the only indication to the user. ...where the cOfflineCmd is a constant telling the BeepOnKey() procedure where it is coming from and what letter it corresponds to in the list. All the above constants do nothing but define how each signal should sound, both in pitch and duration. You can play endlessly with these constants while driving your nearest and dearest to the brink and beyond.